Kongsberg Automotive is one of the world’s leading suppliers of modular and custom engineered steering systems for off-highway vehicles. Our products are in use today in a wide range of agricultural, material handling and construction vehicles manufactured by market leading OEMs across Europe and America. 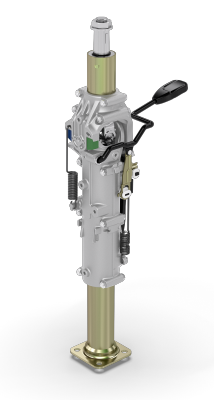 The FC100 Series Fixed Column is an entry level high performance product with multiple fitting options designed to support and complement our complete range of steering systems. When fitted with its optional cover, the FC100 column is directly interchangeable with the higher specification Teleflex tilt or tilt/telescope columns, giving vehicle manufacturers the freedom to offer their customers the steering options to suit their requirements.